Each phase in love is based on specific genetic and chemical elements in our brain. We are all made to believe that romance should last for a lifetime. If we fall out of love, we conclude that the love has ended or that we chose the wrong mate because they could not make the romance last for a lifetime. We divorce and try again with another mate, hoping that this time the romance will last for a lifetime. After two years or so, we fall out of love again, divorce again, and we might try again but never succeed. The issue with these divorces is the lack of understanding of falling out of love. Falling out of love is just a phase in love. It is a painful period that is needed to reach true, permanent love, like how a pregnant woman must go through painful labor in order to have the desired baby. She is willing to tolerate the labor pain because she knows that the pain will end with a tremendous reward -the baby. Likewise, falling out of love will be followed by true love, which will last for a lifetime. Now let us discuss briefly the neuroscience behind this. Romance is caused by increase in brain chemicals. Monoamines (dopamine, epinephrine, norepinephrine, and serotonin) effect the brain. These chemicals cause all the joy, pleasure, jealousy, obsessions, sweating, trembling and so on, of love. This romance period of monoamine release is needed for the brain to prepare for a stronger true love phase by making the nonapeptides (Oxytocin and Vasopressin) making and receiving cells in the brain multiply. A release of norepinephrine is needed to release Oxytocin. The norepinephrine release increases the number of nonapeptide-producing cells and also the number of oxytocin receptors on the nonapeptide-receiving cells. This helps make the true love phase of love stronger and more intense. The reverse is true. People who marry for gains, such as money or power, without falling in love, never experience true love as the nonapeptide-producing cells continue to be few. For those who fell in love, when that goal of preparing the nonapeptide cells for true love is achieved, there is no need for the excess monoamines effect. Our brain stores of these chemicals, and their effects on us will eventually fade away. All the feelings of romance will now disappear. We now lose all the joy, pleasure, obsessions, jealousy and other feelings that come with romance. We perceive this as if our love has ended. In reality, the monoamines phase is no longer needed. Now we are ready to proceed to the true, nonapeptides-based love. The falling-out-of-love phase is just the gap between two systems. The nonapeptides system will take hold soon. How does this apply to divorces? If we look at the statistics of divorce, we notice that it peaks in the third year after marriage. This is the time of the falling-out-of-love phase. 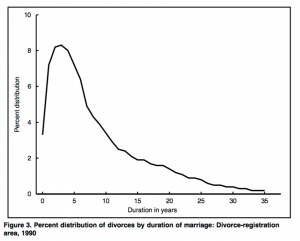 The marriages appearing to last more than three years in the graph on the right are indicators of longer divorce proceedings; the marriages themselves likely did not last that whole duration. We are wrongly taught to believe that the feeling of romance should last for a lifetime. This wrong believe causes many divorces. 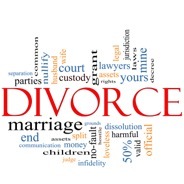 If we understand that it is just a phase of love, we can avoid these frequent divorces. We should realize that, just like labor pains, falling out of love will be followed by a much enjoyable experience: true love. This love phase will last for a lifetime. If you feel that the romance in your life has disappeared, rejoice in the new, more exciting feelings of true love that are coming to you. Hang in there and wait patiently!! True love is coming to your life soon.